(NewsUSA) - Every year on November 11th, we formally thank men and women who have honorably served in the United States military. In fact, Veterans Day was born on May 13, 1938 as a way of honoring the veterans of WWI. Fast forward to 2017, and thousands of our fathers, mothers, sons and daughters have served in WWII, the Vietnam War and War in Afghanistan, to name a few. At Humana, one of the nation's leading health and well-being companies, the commitment to veterans is strong. Humana, across its diverse sites and services, works closely with its members, partners and industry to foster innovation in health care for all of its members, including our veterans. Several partnerships enable Humana to honor veterans through education and guidance about navigating health-care choices -; specifically, when veterans have the opportunity to consider health care options through the U.S. Department of Veteran Affairs (VA) and plans like Medicare Advantage. There are often misconceptions among veterans about how their VA benefits work with Medicare Advantage. In fact, enrolling in a Medicare Advantage plan may provide veterans with additional service and location options. Every day, Humana's trusted advisors are there to provide guidance and clarity on health insurance and wellness matters that impact veterans and their family members. These Humana experts have the unique knowledge to help senior veterans gain a better understanding of their Medicare options and help them to make better-informed health-care choices. For many veterans, the opportunities to get help in understanding health-care choices happen in their local communities. For example, Orlando Gallardo is a 75-year-old veteran service officer from Conejos, CO who has partnered with his Humana agent to help veterans get the education and information they need to secure the right health-care coverage to achieve their best health. "[My Humana agent] understands and appreciates veterans, and I appreciate him." "If we can help a veteran, why not?" Gallardo asks. Gallardo and his agent honor veterans through their partnership and genuine care for our American heroes. One thing that can be confusing to veterans is how their VA prescription drug benefits work with a Medicare prescription drug plan. Gallardo and his agent help veterans understand that they can actually consider either or both options for coverage. But both types of coverage can't be used for the same prescription at the same time. Veterans can also comparison shop for Medicare Advantage and prescription drug plans, as well as research prescription drug costs, on the website Medicare.gov. 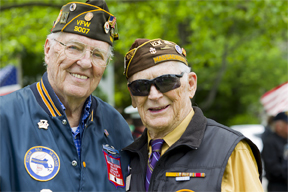 Furthermore, Humana provides guidance about Medicare Advantage plan options by partnering with organizations that support veterans, including through its national affiliate partnerships with the Veterans of Foreign Wars of the United States (VFW) and American Veterans (AMVETS). With whatever health-care options veterans choose for themselves and their families, having a personal commitment to well-being is a part of the equation. Gallardo, a Humana Medicare Advantage member, understands that he has to do his part in staying healthy. "My part is being healthy and to stay active and keep the cogs turning and keep'em oiled," says Gallardo.